I like watching sports. But I also like finding obscure sports to watch. Thus, the reason I've recently written more than a thousand words on curling. Sorry, Canada. And my favorite obscure sports are the mainstream sports that slip under the radar. I don't like using the word obscure to describe them, but neither do I want to call them hidden, underdogs or forgotten sports. There's probably a good word for it, and I just don't feel like looking for it right now. But you get the point. It's why every year I want to go to the worst MLB series that ends the regular season. It's why I want to go to bad bowl games. I always like finding the hidden entertainment in everything. Some people clip coupons and insist on never buying brand names for full price. I want to go a Cubs-Mets series in October. You get me. Well, as it's a new year, it's time for my first obscure/underdog/hidden/forgotten/other sport of the year. It's the Australian Open. Now, tennis is already kind of a fringe sport anyway because, frankly, every time I try to play it, I inevitably get told that I'm breaking some rule of tennis etiquette that is ridiculous. One time, I was going into a court just to whap the ball against the wall, and the gate was near where these two people who clearly were well past their tennis prime were playing. So I went in the gate but didn't cross the court. When they were done with the point, the guy closest to me came over and berated me for even coming in the gate while they were playing the point, saying that wasn't “tennis etiquette.” I haven't picked up a tennis racket since that day. If that's how the bad players are going to treat me, how is anyone good going to react if I play against them? I'm sorry you never made your high school tennis team. Actually, I'm not. I'm not even close to sorry. I tell that story every time somebody asks me if I play tennis, and every time I tell that story I wonder why I should even watch the sport, because it makes me mad. 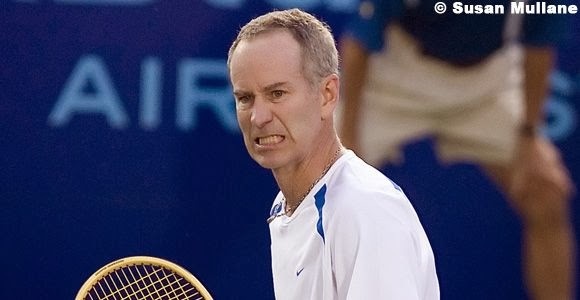 Also, every time somebody tells me they play tennis I count that against them, just a little bit. It makes me wonder if they're that much of a jerk when a newbie taking up the game makes an etiquette mistake. Congratulations, elite sport, you're discouraging people from taking up the game even on a casual, drop-in level. 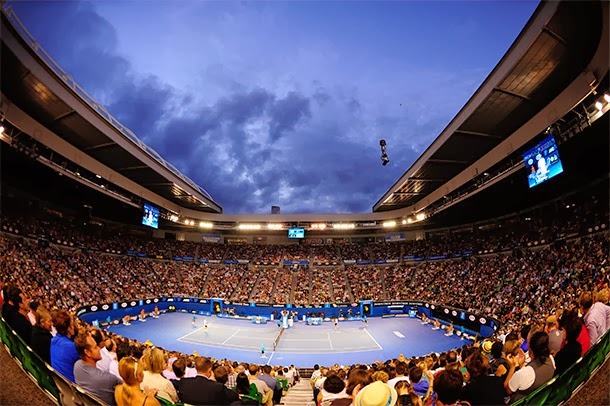 Fortunately, I still enjoy watching the Australian Open for several reasons that really have very little to do with actual tennis. Which is good, because if I thought that jerk berated me for walking in the gate, what would McEnroe or Connors do? I'd probably end up wearing a racket. The best reason for watching the Australian open is the simplest- some of the best matches happen at two o'clock in the morning. As a quirky human being (note: we're all quirky human beings), I get a big kick out of it being a time where I should really be asleep, yet I can watch a live sporting event. ESPN has taken this to a new level by having it's early season college basketball marathon, where a game tips off every two hours for 28 straight hours. I most enjoy looking at the schedule and seeing that, say, a team in Vermont tips off at 7 am Eastern time, or 4 am Pacific. I have always wondered why Oregon or Oregon State doesn't play in this marathon at like the midnight Pacific game, or even the 2 am Pacific game. Since at this precise moment I'm not responsible for covering Oregon or Oregon State basketball, I don't mind mentioning this out loud. This is not to imply even in the slightest that I stay up to watch all these matches. What I tend to do is set up on the couch with the volume on, but not too high, and then I try and mentally program myself to keep an ear on the crowd, because at some point I know I will fall asleep. I cannot tell you how many times I've woken up precisely for match point and seen an upset, or a big win, or something dramatic simply because the crowd got loud and the punch-cards in my brain processed the information and woke me up in time to see it happen, live. I also can't tell you how many times I've woken up to “Mike and Mike” yelling at each other, and been very annoyed, having missed the end of that day's coverage. Waking up to see Maria Sharapova get upset in the second round or Roger Federer win a tense five-setter in the quarters makes that worth it, though. More often than not. When the Aussie open is on, not only is it the middle of the night here, it's the middle of January. Which means low temperatures. Polar vortexes and stuff. In Melbourne, they're in the middle of summer. 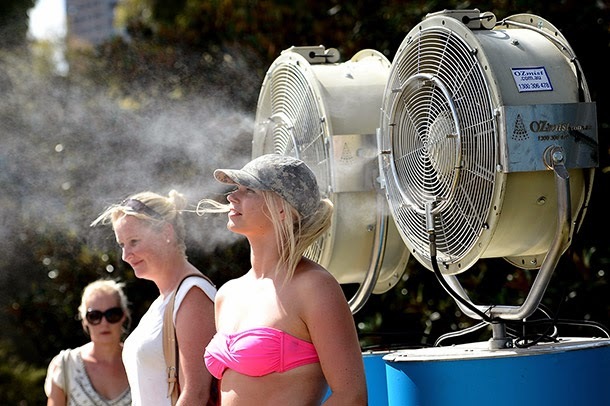 It was 108 degrees there on Monday and people were having heat-related issues. I relish every single reminder of summertime watching the open. Heat indices. Sweat. Ice water. Sunglasses. Floppy hats. Beach towels. Bikinis in the crowd. And, yes, heat-related issues. When it's summer here, those things are commonplace and I don't give them a second glance... but when it's summer there and winter here, I notice every bead of sweat. I notice sweating water bottles, for Pete’s sake. When the announcers say “we're expecting 100-degree temperatures today,” or “heat exhaustion will be a problem,” or share other summery weather alerts, like keeping pets cool and staying in the shade.... well, that does two things. One, I get warmer just by hearing those alerts. Two, I get extremely aware of where I am. Cold, and in the dark. It's not like I'm a watcher on The Wall dressed in fur looking for white walkers and outsiders by any means... but there is snow on the ground outside my window, and it is below freezing. 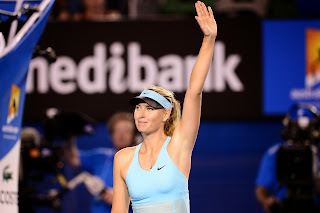 Maria Sharapova in a tennis outfit does wonders for morale. Reason #3: The Olympics are coming. Most of the good Winter Olympic events will take place at night in the United States next month. You'll be up anyway watching those, don't tell me you won't. You might as well get some practice sleeping on the couch. And besides, you'll feel even colder watching curling at two in the morning than you feel now. Might as well get the night sun while you can.